Many people think that in order to stay in shape you have to hit the gym every day or run a bunch of miles every week. This misconception discourages people from maintaining their fitness goals and staying in shape. One of the best ways to stay fit is to maintain a healthy diet and walk at least 30 minutes everyday. Walking is for the most part low impact and when done at a moderate to fast pace, it can help you shed those extra pounds you’ve put on during the winter. Best thing you don’t have to wait for the weather to get warm to get started. Studies have shown that you actually burn more calories exercising outdoors in the cold weather compared to an indoor workout. It’s also great to get outdoors during the winter and breathe the cold air and get yourself some winter sun. So next time you are thinking about heading to the gym or doing some cardio in front of the TV think again and head outside for a nice walk. I was recently sent a pair of Vionic walking shoes to promote the February Walkabout. The shoes are made with Orthaheel Technology, a biomechanic orthotic footbed that naturally aligns your feet and may help to relieve heel pain, back pain, knee pain, any pain caused by alignment issues. Vionic’s annual Walkabout challenge starts February 1st, 2015 (National Heart Health Month). The Walkabout encourages people to live a healthy lifestyle by walking everyday for 30 days (for as little as 30 minutes). The initiative is co-promoted by Vionic spokespeople Dr. Andrew Weil and celebrity trainer Juliet Kaska. This year, Vionic is partnering with SparkPeople, an online platform that helps users to reach their goals and lead healthier lives through free nutrition and fitness tools, expert created content and a vibrant, supportive community. SparkPeople has about 15.5 million lifetime members, many of whom lost weight and achieved better fitness through walking. Sparkpeople will host the Vionic Walkabout challenge through the month of April, at which point, users will be given the option to extend their SparkPeople memberships and continue on the journey to realizing their health and fitness goals. Participants receive exclusive daily emails with motivation and healthy living info including recipes and wisdom from Dr. Weil and fitness moves from celebrity trainer Juliet Kaska. Also a a 3-month free subscription to Dr. Weil’s Spontaneous Happiness and Vionic’s Guide to Getting Active: Tips from the Experts. Make Your Pledge Today – sign up for free online: http://www.vionicshoes.com/2015-vionic-walkabout You can sign up now through the end of April 2015. There is also a walk to win aspect – daily prizes include shoes, cookbooks and more and the grand price is a trip to Napa Valley! The grand prize is based on social media participation – just tweet, instagram and facebook with the hashtag #VionicWalkabout. 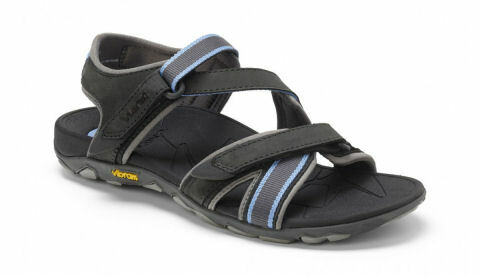 For my summer walking I chose a pair of Vionic Walking shoes, Orthaheel sandals. These shoes are made with Orthaheel Technology, a biomechanic orthotic footbed that naturally aligns your feet and can help to relieve heel pain, back pain, knee pain, any pain caused by alignment issues. EVA for stability in the rear foot and cushioning in the heel and forefoot. I was very excited about these. During the summer I usually wear flip flops because my foot is very wide and not many shoes fit me. These sandals seem durable. The adjustable velcro will let me slip my foot in and I especially loved the good reviews of this product. Many satisfied customers are saying that these sandals and Vionic shoes help them relieve most of the pain in heel and foot. This black Vionic Muir Sandal looks great with my workout pants, capris and shorts. They look like a stylish sporty sandals too and I’m very excited to wear them this summer. * I was provided the walking shoes for free. No compensation was received. All opinions are mine.